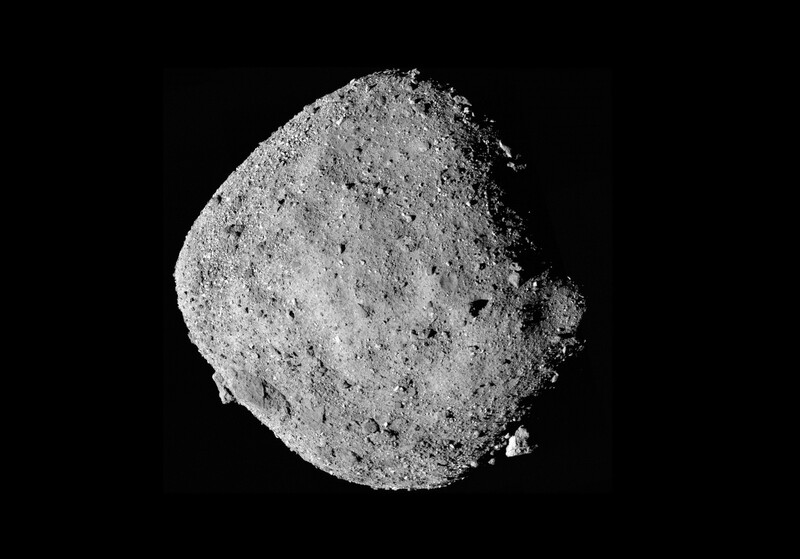 Just one week after the OSIRIS-REx spacecraft’s official arrival at the asteroid Bennu, the mission’s scientists have announced a significant find: Water appears to be locked inside the diamond-shaped mini-world’s clay minerals. Two scientific instruments — known as the OSIRIS-REx Visible and Infrared Spectrometer or OVIRS, and the OSIRIS-REx Thermal Emission Spectrometer or OTES — registered the readings during the probe’s approach phase, which started in mid-August. The findings were shared today during the American Geophysical Union’s fall meeting in Washington, D.C.
Spectral measurements revealed the presence of molecules with bonded hydrogen and oxygen atoms, or hydroxyls. Scientists suspect that these hydroxyl groups are contained in clays that interacted with water long ago. The quarter-mile-wide asteroid is too small to host liquid water, but researchers surmise that liquid water was present on Bennu’s parent body — perhaps a much larger asteroid — before it broke up. “This is really big news. This is a great surprise,” Amy Simon, OVIRS deputy instrument scientist at NASA’s Goddard Space Flight Center, said today during an AGU news briefing. This entry was posted in GeekWire and tagged AGU, Asteroids, Bennu, NASA, OSIRIS-REx, Space. Bookmark the permalink.